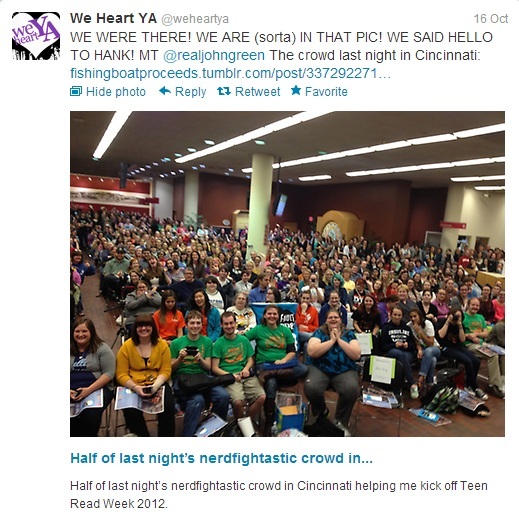 On Monday, October 15th, John Green spoke at the Main Library in Cincinnati, Ohio to kick off Teen Read Week. Kristan and I met up early for crêpes and ate as we walked the remaining block to the library. As we sat outside, scarfing down the last of our dinner, we watched the people walking in and tried to guess which groups were there for John, and who had just chosen an unfortunate time to borrow a book. Sometimes it was difficult to tell, but in most cases, it was obvious — if not by the quirky clothing or the books clutched tightly in their hands, then by their nervous, excited energy. Inside, the place was packed. Anywhere you stood, there was at least one pizza john shirt staring creepily in your direction. There was evidence everywhere of Doctor Who obsessions, and a ukulele player sang Britney Spears songs in the back. There was even a girl dressed up as one of John's books. We managed to find seats only about ten rows back, which seemed too good to be true. It was. See the column in the picture below? We're directly behind it. The kids there seemed excited not only to be in the same room with one of their favorite authors, but also to be among so many people that loved the things they loved and shared the same interests. 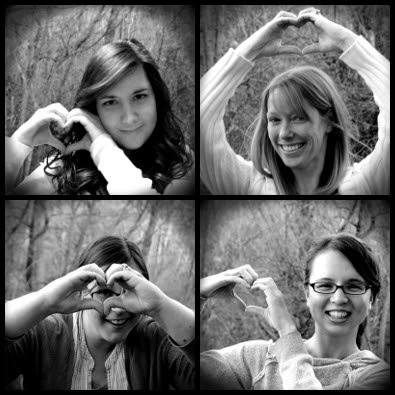 It's amazing to think this is only a fraction of the community that has sprung up around John Green's books and video blogs. John spoke first about why we still read books when there are so many other forms of entertainment available to us, and how today's teens are reading more widely and passionately than ever before. "I want to argue tonight that despite all of the terrible things that you’ve heard about the vapid apathy of this generation of teenagers and how they do nothing all day but look at tumblr, […] that, in fact, today’s generation of teenagers is, in many ways, the best informed, the best read, most thoughtful group of teenagers the world’s ever known." He spoke about how today's teens are reading thousands of words everyday on Tumblr, Twitter, and in YouTube comments — more words a day, he said, than he ever read as a teen. But then he went on to say this text-based interaction is insufficient. That, while literacy is great, it's not enough. Holding up one of his books: "These words are just meaningless scratches on a page, until someone makes them real." He pointed out that when we read books, we have to make the worlds within them real in a way that we don't have to with other forms of entertainment/reading. When we read books, we are put into times and situations and cultures that are foreign to us. "That’s one of the things that reading can give us, and I think it’s one of the things that we most crave. We crave feeling outside of ourselves. […] When I read a great novel, I feel like I am seeing the world out of someone else’s eyes. I feel like I have a life outside of my own — if only for a little bit — and I can imagine what it’s like to be someone else with a complexity that I could never imagine what it’s like to be even the people whom I love the most, who are closest to me." 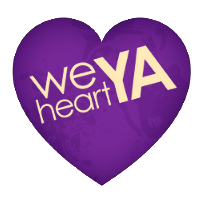 Then John took questions, the first of which asked why he has chosen to write YA. Instead of skirting the question or giving a nice neat answer as I saw many adults do when I was a teen. He answered with seriousness and honesty, explaining how he cannot imagine we live in the best possible world and that he tries not to look for a reason because it just makes him angry. Then he countered that while there is tremendous suffering in the world, there is also tremendous joy. In conclusion, I think one of the big reasons this community of teens has sprung up around John's work is because he doesn't water down his answers for them. Anyone could have heard him speak that night and wouldn't have been able to tell whether it was meant for teens or adults (baring some of the goofier questions about mermaids and cannibalism). And he doesn't hold back in his writing because his readers are younger than he is. He makes an effort to understand them and admits when he doesn't. Update: For anyone interested, you can watch the entire speech on the library's YouTube channel. This sounds so fab! I would definitely go to see him speak if he came anywhere near hear.